with the nonlinear index n2 and the optical intensity I. In the context of self-phase modulation, the emphasis is on the temporal dependence of the phase shift, whereas the transverse dependence for some beam profile leads to the phenomenon of self-focusing. If an optical pulse is transmitted through a medium, the Kerr effect causes a time-dependent phase shift according to the time-dependent pulse intensity. In this way, an initial unchirped optical pulse acquires a so-called chirp, i.e., a temporally varying instantaneous frequency. 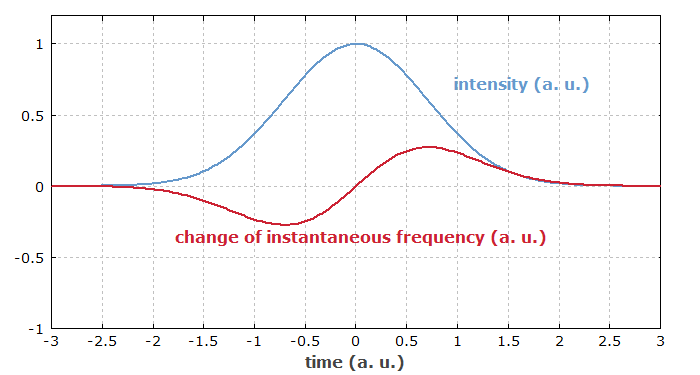 Figure 1: Instantaneous frequency of an initially unchirped pulse which has experienced self-phase modulation. The central part of the pulse exhibits an up-chirp. (In some cases, it may be more convenient to omit the factor L, obtaining the phase change per unit optical power and unit length.) Note that two times smaller coefficients sometimes occur in the literature, if an incorrect equation for the peak intensity of a Gaussian beam is used. The time-dependent phase change caused by SPM is associated with a modification of the optical spectrum. If the pulse is initially unchirped or up-chirped, SPM leads to spectral broadening (an increase in optical bandwidth), whereas spectral compression can result if the initial pulse is downchirped (always assuming a positive nonlinear index). For strong SPM, the optical spectrum can exhibit strong oscillations (see Figure 2). The reason for the oscillatory character is essentially that the instantaneous frequency undergoes strong excursions, so that in general there are contributions from two different times to the Fourier integral for a given frequency component. Depending on the exact frequency, these contributions may constructively add up or cancel each other (see also Ref. ). 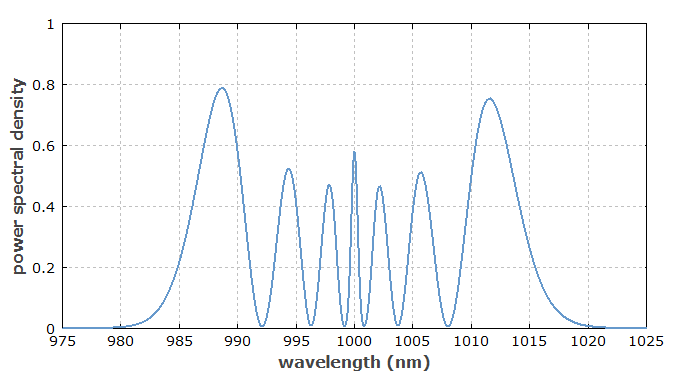 Figure 2: Spectrum of an initially unchirped 1-ps pulse which has experienced strong self-phase modulation (with a peak nonlinear phase shift of 20 rad), leading to characteristic oscillations of the power spectral density. The simulation has been done with the software RP Fiber Power. In optical fibers, SPM can be the dominant effect on an ultrashort pulse if the peak power is high (leading to strong SPM) while the chromatic dispersion is weak, so that the pulse duration remains approximately constant. 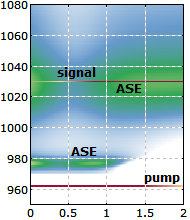 Figure 3 shows an example case where that assumption is well fulfilled within the first 30 mm of fiber; here, the overall spectral width rises about linearly with the propagation distance. Thereafter, it grows faster because anomalous dispersion leads to pulse compression and thus to an enhanced nonlinear interaction. Figure 3: Propagation of an ultrashort pulse in a fiber, where self-phase modulation is the dominant effect on the pulse within the first 30 mm of propagation distance. 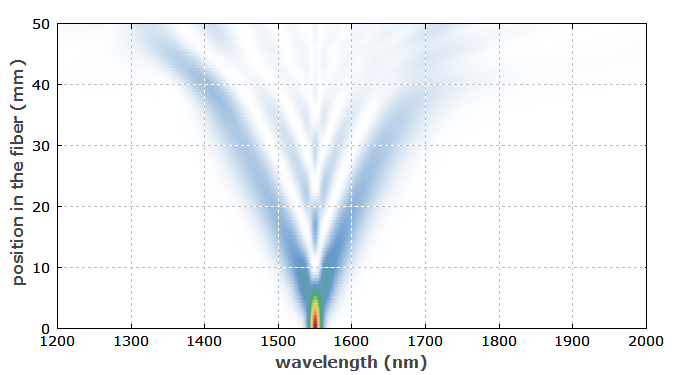 The numerical simulation (which takes into account chromatic dispersion, SPM, self-steepening and stimulated Raman scattering) has been done with the RP Fiber Power software. In optical fibers with anomalous chromatic dispersion, the chirp from self-phase modulation may be compensated by dispersion; this can lead to the formation of solitons. In the case of fundamental solitons in a lossless fiber, the spectral width of the pulses stays constant during propagation, despite the SPM effect. The term self-phase modulation is occasionally used outside the context of the Kerr effect, when other effects cause intensity-dependent phase changes. In particular, this is the case in semiconductor lasers and semiconductor optical amplifiers, where a high signal intensity can reduce the carrier densities, which in turn lead to a modification of the refractive index and thus the phase change per unit length during propagation. Comparing this effect with SPM via the Kerr effect, there is an important difference: such carrier-related phase changes do not simply follow the temporal intensity profile, because the carrier densities do not instantly adjust to modified intensities. This effect is pronounced for pulse durations below the relaxation time of the carriers, which is typically in the range of picoseconds to a few nanoseconds. 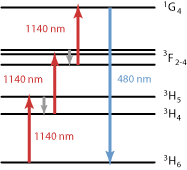 Self-phase modulation has important effects in mode-locked femtosecond lasers. It results mainly from the Kerr nonlinearity of the gain medium, although for very long laser resonators even the Kerr nonlinearity of air can be relevant . Without dispersion, the nonlinear phase shifts can be so strong that stable operation is no longer possible. In that case, soliton mode locking  is a good solution, where a balance of self-phase modulation and dispersion is utilized, similar to the situation of solitons in fibers. Strong self-phase modulation can also arise from cascaded χ(2) nonlinearities. Basically this means that a not phase-matched nonlinear interaction leads to frequency doubling, but with subsequent backconversion. In effect, there is little power conversion to other wavelengths, but the phase changes on the original wave can be substantial. R. Paschotta, "Effect of self-phase modulation on the pulse bandwidth"